This is a little bit interesting. My eight year old flip-phone puked yesterday. It powers up and then just sits. It has not had an easy life. It has gone swimming with me after I came home dripping sweat from long, summertime runs. It sat out in snow banks. It has been dropped a countless number of times. Just for the record, I have never been swimming with any of my firearms, nor have they been buried beneath a snow bank for several weeks, nor have I dropped one. The cell phone finally gave up the ghost. I am leaning toward a Casio Brigade. They can be had, used, on fleabay for about $25. They are a "ruggedized" slider with a QWERTY keyboard. Mrs ERJ suggested that it would be nice if my end of our text conversations were more than single, short words. My problem is that my credit card ceased functioning three days ago. I was not too worried. It expired at the end of this month. I looked through my mail and was not able to find the replacement card. Hmmm! Cell phone communications compromised. Credit locked up. Now I know how Mr Putin feels. A more likely explanation for the lost credit card lies with the US Post office. Our rural delivery people had been driving their own personal vehicles and were reimbursed. My delivery person drove a four-wheel-drive Ford truck. They were reimbursed on a per-mile basis. I don't think any of them made money on that reimbursement. In an effort to save money, mail trucks that were no longer good enough for urban areas were reassigned to rural areas. These trucks have oversized, aluminum bodies on underpowered, two wheel drive chassis. They were purchased in 1989. The floorboards have rusted through so they have "Flintstones" braking capability. These vehicles are not competent on icy or snowy dirt roads. I saw one stuck, unable to clamber back up the smooth, icy crown of the dirt road. USPS delivery people have become very conservative about delivering the mail. They are not taking any chances. Situations that they could have blithely plowed through with their rural Michigan capable personal vehicles have become no-go zones with the USPS urban reject vehicles. This winter has seen many days when the mail was not delivered. So the letters go back to the post office and drop out of the normal process flow. The other plausible destination of my replacement credit card has it falling through the rusted out floor board and on to the road. Welcome to Eaton Rapids, Michigan, USA...third world country. My credit card company is sending me a new card. Maybe this one will get to me. I try to avoid "me-too" posts. The bloggers I follow don't get enough recognition. They certainly shouldn't have to share it with a guy poaching their ideas. Every once in a while an idea or an insight comes along that demands the widest possible audience. I doubt that I have very many readers who do not also read the very excellent OldNFO blog Nobody Asked Me but I figured it is worth risking Mr Curtis's ire to spread the message. The Atlantic Magazine published an article by Graeme Wood in the March 2015 issue titled What ISIS Really Wants. Mr Wood's article is NOT the recitation of stale, over-quoted boilerplate. Mr Wood interviewed Muslims in Australia, Britain and Philadelphia. He interviewed peer-recognized experts from Princeton and other places. The cornerstone of Mr Wood's essay is that we are guilty of viewing ISIS from the perspective of the secular west. From that perspective, ISIS is a bad LSD trip that never pops into focus. Viewed through the lens of Koranic prophesy, ISIS is logical, coherent and very dangerous. An example that will resonate with Bible reading Christians is to imagine a cult leader who has meticulously crafted his ministry to tag every "box" in the Revelations "end times" list. An example that might resonate with more secular readers is to consider Hitler's message. The German peoples of the 1930s were humiliated and marginalized. Hitler presented them with a script. In this script, the German peoples...the Aryan Nations...had been selected by God. They were the superior race whose birthright had been stolen by envious, crafty, inferior races. Hitler held up a template populated with cherry-picked "facts": Do these things and we will be reinstated as humanities rightful, legitimate, God-appointed rulers. Eric Hoffer's book The True Believer (1952) is an extended essay on how this message is received by people who feel that they are marginalized, powerless, alienated. This message is psychic heroin for the humiliated (WWI) German nation. They lapped it up like a dog gobbles up its own vomit. And so it is for the tens of thousands of Muslims streaming to ISIS, feeling that they are called by God to be agents in the inexorable, unstoppable, cataclysmic shifting of history. Graeme Wood proposes that ISIS will self-immolate when there is sufficient evidence that the Caliphate is not authentic, that it is neither inexorable nor unstoppable. The best way to make that evidence visible is to contain the Caliphate. By all means, recognize the Caliphate as a viable foe, if not a legitimate state. Bomb the oil facilities that provide them with revenue. Deny fertilizers and agricultural chemicals that can be used for explosives and chemical weapons respectively. Blockade all food that they import. Force them to demonstrate their fitness-to-rule by denying them all external scapegoats and external enablers. Life is hard. Death is even harder. It is a hard, biological reality that the entire body will die if even a few of the body's cells (as a percentage) are infected with HIV. The entire body will die if even a few cells in any organ cease to function or start to multiply without bound. This is unfair by Western standards but it is the biological reality. ISIS is not "The Junior Varsity Team. ISIS is a carcinoma. It poisons its environment. The body that tacitly tolerates the first cells of ISIS is no less doomed than an untreated HIV positive patient. Those people who will be identified as "collateral damages" are already dead. Only the details need to be written. It is not fair. But it is a reality. ISIS is a carcinoma that must be rooted out by Muslims in the middle East. It will likely require some boots on the ground to sort out the players. It will likely require boots on the ground to avoid a repeat of the power vacuum that lead to the first infestation. Attempting to bend the realities of ISIS to conform with the secular, western, candy-coated paradigms is as stupid as tripping on dirty LSD. ISIS is a rabid animal. It should be isolated so the viruses will die. The host can either mount an immune response and throw off the infection or it can die. From an epidemiology standpoint, the only important thing is that the infected host dies or recovers without infecting any more victims. Have you ever had that dream where you are careening down a dark, rain-slicked street? You are going way too fast for the conditions. The road starts curving. Pedestrians and vehicles (garbage trucks that are backing up in my dreams) pop up in your windshield. The steering wheel comes off in your hands. The brake pedal stop working. You stomp on it hard enough to drive your foot through the floorboard and the car keeps accelerating. Have you ever had that dream? Parents have that nightmare a lot. Belladonna is old beyond her years and cursed by a double helping of empathy. She is watching one of her best buddies make bad decisions and started having those dreams. This buddy has been Belladonna's friend ever since they were "Little Duckies" in Miss Lisa's dance class. They were four years old at the time. Little Ducky is smart and very, very pretty. Little Ducky went off the rails late in her Junior year of high school. She will not be marching down the middle of the Eaton Rapids school gym with the rest of the Class of 2015. At first, Little Ducky was taking "Alternative Ed" classes. These classes are delivered, for the most part, via computer. They have been a God sent for many students. People in small towns can be cruel and some people are exquisitely sensitive to criticism. Computer based classes can save those students. Little Ducky did not stick with it. Little Ducky turned into a "bum magnet". Little Ducky moved in with her latest bum who lives about fifteen miles away from here. The bum is cutting Little Ducky away from her friends and family as surely as an Orca finesses a sea lion in the surf. It is as painful to watch as the cheesiest, most cliche horror movie. You know how the next 10 scenes will play out. There is no suspense. Only pain. Belladonna was attempting to text Little Ducky last night and the bum had Little Ducky's phone. People who text a lot (we are talking teenage girls, here) develop idiosyncratic spellings and grammar shortcuts. Little Ducky was not responding to Bella's texts, the bum was. "Nope. Cant go to lunch with you tomarra. I gotta wash bums clothes." In the good old days "Dad" would visit the bum and lay a little hickory on him. There is no dad in the picture. Of course, it never did any good. There is a victim-enabler-persecutor triangle at play in these dynamics. It is all scripted by the bum. The only person capable stopping the script are the Little Duckies of the world. They have to walk away. Sometimes they walk away before the bruises. Usually, it happens after the bruises. Regardless of how long it goes on, it goes on way, way too long. And, tragically, the net effect is that the Little Duckies simply trade one bum in for another. This is tearing Belladonna up. There is nothing she can do about it. Changes in grammar and spelling are hardly enough to report to the authorities. The reason she wants to have lunch with Little Ducky is to see if there ARE bruises. She suspect that the reason the bum is shortstopping the text messages is because there are. I know that many of my readers are far more worldly than I am. I would love to hear from you. Realistically, is there anything more that Bella can do other than patiently attempting to make contact and waiting in the wings? Hulinek's Lighting Service was started by John Hulinek in 1983 and is located in Charlotte, Michigan about 20 miles southwest of Lansing, Michigan. The last time John Hulinek worked as an employee was the Friday in 1980 when his boss handed him a paycheck and informed him that the company was reorganizing and did not need his services on Monday. Perhaps you remember 1980, the prime interest rate was over 17%, crude oil was $107 a barrel (adjusted for inflation) and Americans were being held hostage in Iran. Mr Hulinek had a young family. He took on many free-lance gigs to pay the bills. One of those free-lance gigs involved representing a building/maintenance supplier in the small communities southwest of Lansing, Michigan. This work had definite logistical benefits. Mr Hulinek's home is in Charlotte, Michigan right in the middle of the sales region. Mr Hulinek was a whiz at getting orders but the firm he represented was not fast in fulfilling them. Orders were taking more than thirty days to execute. That is a major problem when you are getting paid on a commission basis. It also makes repeat sales tough....why order more when the first order has not been delivered? Mr Hulinek sat down with his dad and they had a long, serious talk. John was sure that he had the organizational skills, the drive and the knowledge to run circles around the guy who could not deliver the orders. His dad arranged a meeting with an electrical contractor in the Lansing area. The contractor said, "I am taking a chance that the apple did not fall too far from the tree. Just remember, if you screw up it reflects poorly on your dad." Mr Hulinek decided to concentrate on lighting products. All of the big, local suppliers considered lighting products to be a sideline, an annoyance. They had very high mark-ups and lackadaisical service. The electrical contractor, in a huge leap of trust, allowed Mr Hulinek to buy lights and electrical supplies from the contractor's major suppliers and put it on the builder's account. That was in 1983. In three years he was selling enough light bulbs and miscellaneous electrical supplies to match his previous wages. Mr Hulinek's core business was selling light bulbs to businesses. One day, a business owner asked John to supply the light bulbs and fixtures for the business owner's new house. The business owner was too busy with her business to focus on the construction project. She said, "John. I trust you. I know you will take care of me." The construction crew was a bit apprehensive. They did not know this "Hulinek" guy. They had seen lots of screwy stuff over the years. They had seen countless fly-by-night suppliers come and go. They knew that there are a lot of things you can screw up when there are over 200 light fixtures to install. They were stunned when the lights were delivered to the job after the paint and trim was done. Each box sported a sticker designating which room it was to be installed in, the location in the room and the switch it was to be wired to. There was also a master list with a graphic. Mr Hulinek did it out of self defense. Delivering the lights to the jobsite ensured that they were handled gently. Overkilling on identification ensured they were installed once...in the correct location. The more the lights get handled the more likely they are to be damaged. One-and-done made Mr Hulinek money. The construction crew did not care about Mr Hulinek's reasons. They were delighted that they did not have to play any guessing games. Tearing stuff out and redoing it cost them money, too. He became their default supplier of lights for future construction. Soon he was supplying fans and venting. Then he was selling central vacs. Get big or get out??? Mr Hulinek experimented with expanding his business three times. Each experiment cost many thousands of dollars. It is Mr Hulinek's opinion, based on data, that adding the first employee requires that revenue must grow to 2.5X base.....to break even. Additional costs come from regulatory compliance, accounting, insurance. Administration tasks sponge up the business owner's time. The net increase in "worker" is 0.5 while the minimum business volume must increase by 1.5. There are many, many businesses that can comfortably accommodate a single proprietor but will founder with the additional ballast of a single employee. What is new in lighting? It is pretty well know that people who are afflicted with Seasonal Affective Disorder (SAD) can be helped by increasing exposure to blue light. Mr Hulinek told me it is a little bit more complicated than that. Edited from the work of Dariusz Kowalczyk. Our bodies are tuned into to a circadian rhythm based on a spectrum that is red-shifted early in the morning and late in the evening and blue-shifted through the "productive" parts of the day. Those red-shift hours correspond to lights tuned to 3500K lights and the blue-shift hours correspond to 5000K-6500K-8000K. The red-shift lights generate melatonin, calms us down and prepares us for a restful night's sleep. The blue-shift lights beef up the serotonin levels and make us brave, confident and energetic. The upshot is that somebody who works at home might want 6500K in their office space and more red-shifted lights in their family space to "not harsh the mellow". Another consideration is the interaction between lights and headaches. There is medical evidence that flashes of light can trigger headaches. This may be due to the "startle", fight-or-flight reflexes that are triggered and muscles tense up in anticipation of the need for rapid acceleration. Some lights have 60 Hz flutter or striations. The video posted above shows a fluorescent light driven by an inexpensive. "commodity" ballast....the only kind that Big Box stores sell. Those one-hundred-twenty flashes a second trigger debilitating headaches and muscle tension in some people. As a male, it humbles me to know that women are much more vulnerable to striation effect because their minds simply work more quickly....or that is what Mrs ERJ's tells me. The solution is to install "antistriation" ballasts. Antistriation ballasts convert the line power to a high capacitance, low-pass filtered, DC power source. They smooth out the flutter. By default, Mr Hulinek will sell you antistriation ballasts because you, as the business owner, might not notice the difference but half of your potential patients and customers will notice. If the topic of interactions between lighting and human health interest you, you can follow up by visiting the Human Centric Lighting website. Point light sources (halogen spots) are nearly ideal for sales. They make diamonds sparkle, make translucent objects glow and add depth and texture to nearly everything else. Unfortunately, Federal laws made it increasingly difficult to get those kinds of bulbs. Merchants and landlords responded by replacing burnt out bulbs with compact fluorescent bulbs with dismal results. Colors were muddy. Detail was blurred. Sparkle was lost. Cheap goods looked just as good as the premium products and it was much harder to sell the customer the high-end products when they could not see any difference in the show room. LED technology is coming to the rescue. Call John Hulinek (517-543-5658) if you want a crash course on how to re-bulb your sales space to LEDs to bring back that WOW! experience for your customers. John has experience in selling furniture, automotive accessories and many other things. He understands retail. At first glance, central vacuums seem to be an odd thing to combine with lighting supplies. As explained earlier, Mr Hulinek got into bathroom fans because they are often co-wired with bathroom lights. His supplier of bathroom fans also sold central vacuum systems and it was easy to also offer that particular brand to his builders. Once Mr Hulinek was selling a significant number of central vac systems, one of Mr Hulinek's other suppliers took it upon himself to educate Mr Hulinek on the ecosystem of central vacs. The key to selling central vacuum systems is to not compete with portable vacuums, to offer what portable vacuums cannot. This has become more difficult as portable vacuums with a retail price of $125 now incorporate features that used to be found on commercial vacuums that sold for ten times that prices. Mr Hulinek's wholesaler told him that he needed to sell central vacuum systems that exhausted directly outside. What is the advantage of any vacuum, from an allergy standpoint, if you must still fight with bags and reservoirs? Traditional vacuums do not eliminate allergy hazards. They concentrate it and move it to a bag or canister that the owner must touch and breath when changing them. Venting the exhaust directly to outside eliminates all of the secondary dust handling. Mr Hulinek's wholesaler also told him that central vacuums can be "green". A typical portable vacuum has a life expectancy of a bit more than three years. It is a case of cramming ten pounds of fertilizer into a five pound bag, it can be done but don't expect the bag to last very long. A high quality central vacuum system will run without a hiccup for forty years. So the choice is thirteen portable vacuums or one central vac system. Finally, central vacuums are inherently quieter than portable units. Portable units sound like a turbo jet powering up for take-off for two reasons: Power density and high speed, spinning impellers. Central vacuums use larger, slower turning impellers, the power unit is much more massive than a portable unit. And the power unit is usually located in a utility space. 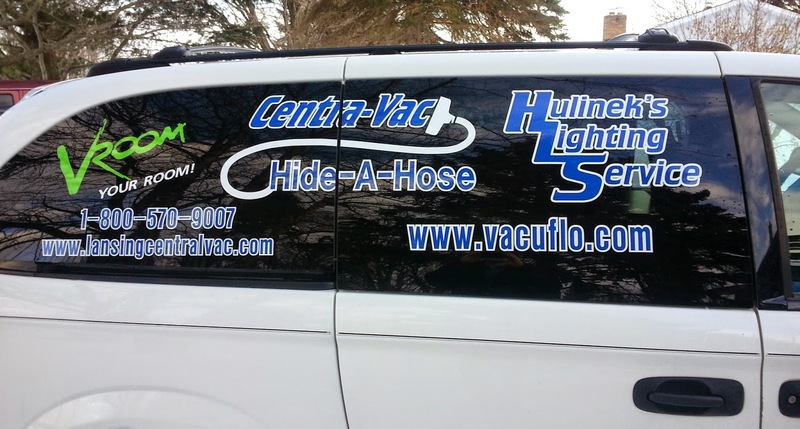 If you are going to sell central vacuum systems you should be selling the brands that capitalize on the strengths of central vacs: Mr Hulinek changed brands after that conversation. You don't have to figure all of this business stuff on your own. Many people have gone before you. Some of John's personal favorites are the Bible, Norman Vincent Peale, Tony Alessandra, Dale Carnegie, and Jim Rohn. We live in a very blessed time. You don't even need to read to reap the benefit of the collective store of human (and divine) wisdom. You can learn much on Youtube for the effort of typing in a few, well chosen key words. In retrospect, Mr Hulinek was successful because he was brave. He had no choice. One of Mr Hulinek's clients is a Rabbi (Jewish). Mr Hulinek asked him if he thought Jews were consistently successful at business because of the wisdom found in the Hebrew Testaments: Proverbs, Sirach, Wisdom and Psalms. The rabbi's eyes sparkled with humor. "Are you crazy? Jews succeeded at business because nobody would hire us. We had no other choice." But it is more than that. Every business person will face periods when things do not go well. God gives us time so we do not need to solve every problem at once. Be brave. Keep going. God let's us paint ourselves into corners because most of us are too timid to be successful otherwise. Mr Hulinek's business evolved as he listened to his customer's needs. He tested those markets to see if they were a businesses he could profitably serve. According to Kelly Blue Book, a seven year old minivan with 100,000 miles on it costs about $3500, or 10% of the cost of a new van. In Mr Hulinek's experience, a vehicle can easily go 200,000 miles if treated gently and well maintained. Other than ego, what is the advantage of buying new? Don't be afraid to be the "right size"
Eaton County, Michigan is not a big market. There is a "knee" in the curve. Life is good in the knee. You will be given much information regarding pricing by your suppliers. Listen to them. They want you to be successful. 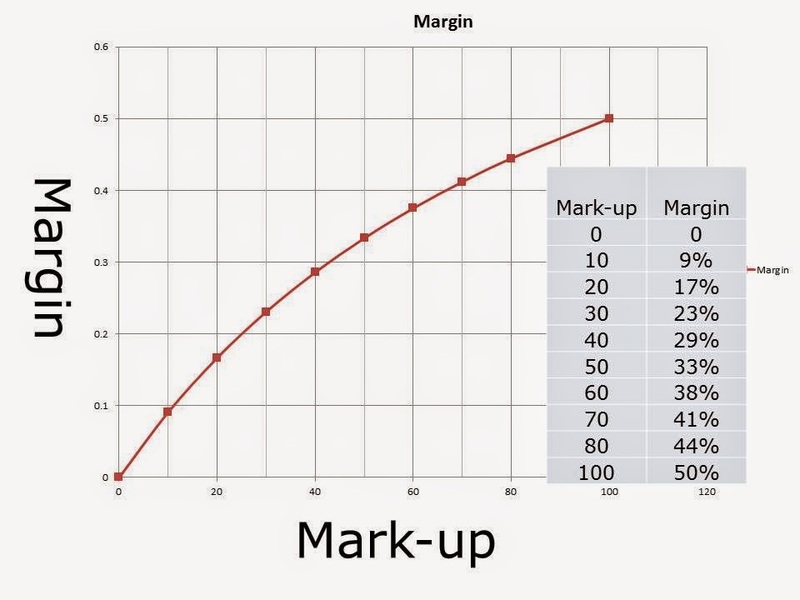 Make sure you understand the difference between mark-up and margin. A one hundred percent mark-up may seem exorbitant, but realize that some products are thinly traded and you will end up "eating" some of that inventory. Mr Hulinek delivers. The easiest way to allocate that cost of delivery is to carry it in the mark-up. Finally, some markets expect "discounts" and you cannot give anything away if you are already priced to the bone. Nobody ever embraces rejection. The best one can hope for is a certain numbness. This ties in with the Be Brave. Success is a numbers game. Mr Hulinek made thirty cold calls a day, five days a week. Every week. He had contact with every business within his region at least once every month. Some of those businesses placed their first order three years after his first contact. That was thirty-six contacts and, thirty-five rejections after he started. From his customer's standpoint: They had seen many flash-in-the-pans. They heard many promises. And they never saw most of them again. John called them. John visited them. John was always respectful. John suggested certain kinds of spotlights that would display their products in the best possible way. Month-after-month-after-month. Even when he did not make sales, they were part of his territory. They were his people. He kept calling. A guy who displays loyalty and steadfastness, even when they are not being paid, gains a certain stature. How can you doubt that he will be there for you when you have a problem? He is there for you now. Eventually, they would place an order. His job then became to deliver service that exceeded anything they were used to. The intention of the Expo is to showcase Eaton County businesses to the general public, to increase the visibility of the Local Chambers of Commerce and to facilitate networking and mentoring between local businesses. .
One feature that makes this Expo unique is that there is as much space allocated for non-profits (colleges, human services, religious organizations) as is allocated for for-profit enterprises. Fees for table space range from FREE (for non-profits) to $175 for member tables to $375 for non-member, for-profit tables. The show will be held at the Charlotte, Michigan High School. Admission will be $5 a person. Children under age 5 are admitted free when accompanied by an adult. Saturday's highlights includes a Free Hotdog. Sunday's highlights include a Pork dinner for a paltry $5. The group of guys at the coffee shop changes over time. One of the guys had back surgery and is in in rehab. A new guy drifted in and he has had a rapt audience since we have not heard his stories before. This fellow is a gifted and animated story teller. As often happens, yesterday the conversation turned to firearms. Everybody at the table had at least one firearm for home protection. Everybody except for Charlie. Charlie relies on yellow tape, sidewalk chalk and cheap ketchup. The new guy told of a discussion he recently had with a Pacifist Christian regarding firearms. The new guy pointed out that the Canon of the Christian Bible includes "Old" or "Hebrew" Testament. The Old Testament has very clear instructions on the responsibilities men have to protect. The Pacifist Christian kept thrashing around. He claimed that our Christian duty is to let God handle that, to rely on the hand of the Holy Spirit to protect us. The new guy responded..."Why stop at self defense. Why not quit your job and let God feed and house you as well? We are the hands of the Holy Spirit. Sometimes those hands hold a shovel or type on a keyboard. Sometimes they hold a Remington 870." I was talking with my friend Dino on the phone this morning. I was describing the project I was working on, even as we spoke. "No good." he said. "I cannot picture it in my head. Put some pictures and a video on your blog for me." Dino, this one is for you. A shell stripper for single stage reloading press. The stripper proved impossible to photograph due to being buried. Stripper is thin black strip to the left and below the thick, white line. 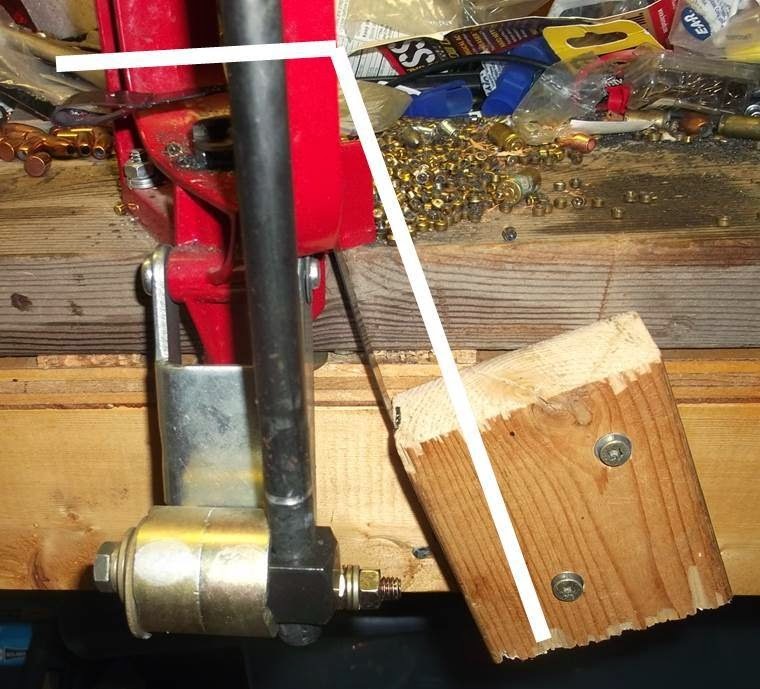 Stripper attached to small 2X4 block to allow easy adjustment/removal. Looking over the top. End of stripper is bent into a shepherd's crook so it can ride over shell holder. Source of the spring steel. I knocked the teeth off. The bends at the top were made by heating up the strip and bending. The highest stresses will be at the bottom and that was left as-is for heat treatment. The horizontal is approximately 2.5 inches. Strip looks funny because it is smeared with grease. The stripper ejects with varying velocity. The faster you bring the ram down, the more aggressively it pops them out. A five second video of the stripper in action. This turned out way better than my typical first prototype. Now, I will see how long it lasts. As reported earlier, I took two boys to Saturday's Gun show. Being fifteen year old boys they were not able to travel from Eaton Rapids to Mason without requiring food. The Wooden Nickle sold lottery tickets and keno. Kubota's friend did his best to convince me that buying lottery tickets is a sound investment strategy. He quickly lost interest when I started showing him how to calculate the odds. I hate to waste a good lecture so I am going to recycle it by posting it as an essay. Consider the Mega Millions lottery. The first five numbers range from 1-through-75 inclusive and do not repeat. The sixth number is drawn from a pool from 1-through-15 inclusive and can repeat one of the first five. Let's look at the first number the customer picks. There are five chances of it matching one of the drawn balls out of seventy-five total choices. The chances of also picking the second number correctly is one chance in four matching (remember, you already knocked out one with your first pick) out of a pool of seventy-four numbers. Multiply in the Mega Ball (1/15) and you end up with about 1/259,000,000 chance in winning. So one might assume that the purchase of a one dollar Mega Million lottery ticket is revenue neutral when the jackpot is about $260,000,000. You would be wrong because the winner must share the jackpot with everybody else who picks the winning numbers. This is a case where thinking like everybody else is not to your advantage. This is a great time to be unpopular, a skill that Belladonna assures me that I have refined to a world-class level. In fact, I have raised this skill to a science. The first rule is to avoid numbers below 32. When a person chooses "My numbers" they choose numbers that are easy to remember and have a personal connection to themselves. Dates, for instance. Months run 1-through-12. Days of month run 1-through-31. The first half of this rule (avoid numbers 1-through-12) is the only rule that can be applied to the Mega Ball. The third rule is to avoid numbers like 34, and 67...numbers where the second number is one greater than the first number. There are some anomalies. 60 is a very unpopular number, perhaps because this is THE milestone birthday when we must kiss the illusion of middle age goodbye. 68 and 70 are not popular but 69 is (for reasons ERJ refuses to speculate upon). 80 is out also an unpopular number but it is outside the range. The common perception is that randomly selected numbers must look, well, random. In fact, any string of numbers is random. The string 60, 61, 62, 63, 64 is as likely to show up as any other combination of five numbers. The least sophisticated buyers are unlikely to list strings that appear ordered on the mistaken belief that they are not random. The downside is that statistically sophisticated ticket buyers might seek out these strings on the belief that they are less likely to share winnings. One unknown is the easy-pic algorithm. Does it have "rules" that delete non-random appearing strings? It would not be that hard to code and it would make the majority of the customer base happier. That is something to think about. In the end, the utility in buying lottery tickets is not economic. There is no way to justify the time and pro-rated gasoline expenditures on the infinitesimal net value of a lottery ticket even when the jackpot is enormous. The utility in lotteries is their uniqueness. Where else can you rent a hundred million dreams for a buck? You have to keep re-renting those dreams, but it makes life endurable for many people. Lotteries are not "sweet dreams" but "cheap dreams". The problem is that some dreamers mistake the lottery as a sound investment vehicle and invest more than $2 a week. ERJ advice: Rent the dreams (if you want) but don't buy the hype, don't think of the lottery as an investment. This is from Mrs ERJ and I have been unable to work it into any other essays. -Consult a dictionary before using unfamiliar adjectives to describe to your spouse. The words "penultimate" and "superflous" might not mean what you think they mean. The ERJ family is in the throes of Income Tax preparation. Our efforts to simplify our lives is starting to pay off. For the most part we go to one drugstore and donate to a very small number of charities. We still get cold calls from charities. I am sure Mrs ERJ is on a list as a soft touch. I am not the only person who recognizes that she is an extraordinarily generous person. So far, my favorite charity is "Pretty Good Charity". We did not donate to them but I applaud their modesty. The fellow on the phone was most engaging. PGC collects donations and disbursesthose funds to other charities (the caller was unable to tell me the names of those charities) that meet their Pretty Good criteria. After, of course, deducting a processing fee. I believe they have a branch that solicits funds from people with traditional Jewish last names. They go by the name "Chutzpah Charity". Sunrise. -17 Fahrrenheit. Smoke from a neighbor's wood burner trapped by multiple inversions. I apologize for the crappy photo. Fuji has yet to develop an autofocus function that works on haze. Traditional throughput analysis focuses on bottlenecks and is called Theory of Constraint. This essay is a primer on Theory of Constraint. This is a simple assembly line. It is where you buy your deli sandwich. You may have cursed how slowly it moves. The primary advantage of talking about a deli is that everybody has watched the workers assemble the sandwiches and participated in the information flow. Worker A takes the order, picks the bun and adds the meat and cheese. Worker B adds the vegetables and condiments. Then they wrap and bag the sandwich. Worker C pads the order with high profit add-ons like drinks, cookies and chips. They also work the cash register. The average time a sandwich spends in each station is shown above. The line is paced by Worker B. The typical time spent in Worker B's station is 90 seconds. That means that the revenue and profit of this restaurant is hard-stopped by the the bottleneck in Station B. If a typical "lunch rush" is 90 minutes long, this process can only serve 60 customers. This is a case of customers will come if you "build it", throughput, that is. Customers make decisions based on the length of the line and the number of cars in the parking lot. They will go to a less-preferred restaurant if they believe the wait will be too long. The first step is to identify any work that can be pushed to a faster station. One possibility would be to move the wrapping and bagging to Worker C. The problem is that Worker C touches money and gloving/degloving takes an excessive amount of time. From a business standpoint, Worker C can make-or-break the enterprise. Much (perhaps even most) of the profit is in up-selling the add-ons. Each item selected takes about 10 seconds. Two seconds is consumed in communication between the customer and the worker for each item. Most customers communicate two items at a time. The worker verbally verifies and looks up to ensure they heard the order properly. Conversations with workers indicate that a major aggravation results when customers keep asking for more items. That makes the sandwich difficult to fold and wrap. An even greater aggravation occurs when a customer wants amounts removed because the worker applied too much. Mayo is not easy to remove. For whatever reason, it is easier to identify high tech solutions to problems than it is to identify low tech solutions. Cool tip: Mark the selections with a black felt tip pen (or pencil). Invert the signal so black-becomes-white on the projection TV. Produce a card that is an analog of the vegetable/condiment layout. Request that the customers pre-mark their selections on the card. The card would be inserted into a holder beneath a camera. A projection TV would project down onto the workspace and illuminate the customer's selections. It would probably be necessary to paste reflective targets above each bin for the projector to "paint". Estimated number of customers for a 90 minute lunch rush is an additional 9 customers for a 15% improvement. Install self-serve payment. Worker #3 never touches money and can leave his/her gloves on. Workers can still handle drinks/chips with gloves on. Have Worker 2 and Worker 3 rotate. They make a sandwich and handle the up-grades. Estimated number of customers for 90 minute lunch rush is an additional 30 customers for a 50% improvement. Allow customers to buy "sticks of bread" and jump over bottleneck(s). Determine what the customer must be charged to match the average net profit, less add-ons and charge that for bread. Customer could buypass both Worker 1 and Worker 2. Worker 3 has much excess time and can use tongs to "bag" bread and walk it to the register. The add-ons, the drinks, cookies and chips are the primary profit drivers. While it might not seem "fair" for them to cut into the line ahead of earlier customers it must be remembered that the earlier customers also had the option of buying just a stick of bread and add-ons. Ultimately, having these express customers skip Worker 2 will benefit everybody because it speeds up the line for everybody else and the express customer gets "rewarded" for not being high maintenance. One function of charging for goods is to ration them in times of scarcity. This is sometimes called "the parking meter function of money". This utility of pricing is that it rations goods that are in short supply by modifying customer behaviors. Worker 2 can keep up with Worker 1 when they only have to deal with 2 vegetables and one condiment. It seems perfectly fair to charge for items over-and-above those three. This serves two functions. It turns higher maintenance customers into profit centers and will modify their behaviors. Some delis offer the option of heating the sandwiches. This drives much chaos into the production line. Heated sandwiches should also be treated as a for-pay option because it makes everybody behind them wait. Add a Work-in-Process or a buffer station between Worker 1 and Worker 2. Sometimes Worker 2 gets a very simple order and can get ahead of Worker 1 but cannot capitalize on that because they are starved for their next sandwich. Upgrade the gloves so Workers 2 and 3 can track with their customer from start-of-vegetables to end-of-checkout. The super-cheap, limp, disposable gloves used in most delis take too long to don to make this a viable solution. Worker 2 should never leave their station to restock. That should all be handled by Worker 3. Worker 3 can catch up. Worker 2 never can. Over the course of the last week I stumbled across a couple of neat ways to help students become comfortable with the paradox of the Trinity (a Christian concept). That is, how can something that is three distinctly different and separate items also be one. One of the guys I drink coffee with shared this analogy. Take the student. Hand them an ice cube. Ask them what it is. Have them drop the ice cube into a frying pan. An electric skillet is a handy teaching aid if you are a Sunday School teacher. Turn on the heat. Ask the student what they see after the ice cube melted. Turn the heat up. When the water is half evaporated, ask the student what the water is turning into. Yup, three states of matter. Three distinctly different materials with different properties. Still, it is all H2O. 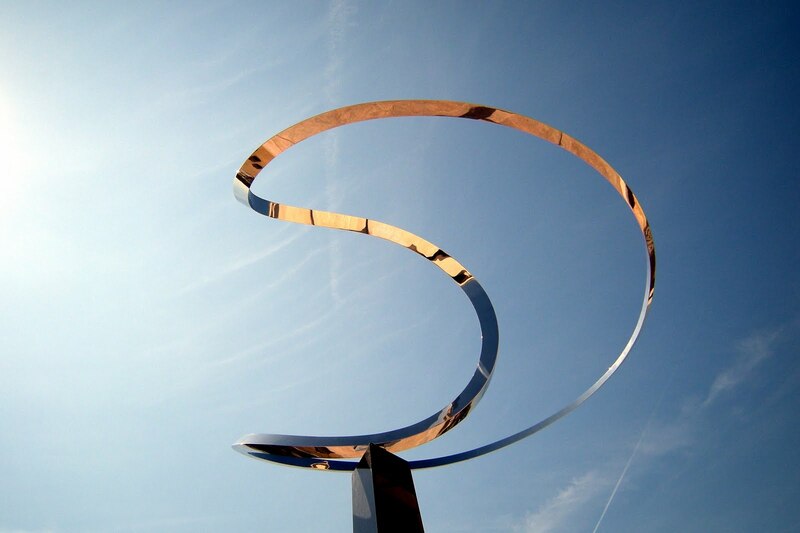 Designed in 1965 by artist José de Rivera (1904-1985), who titled the piece Infinity, the looped sculpture is based on a mathematical figure known as the Möbius strip. A Möbius strip has just one side and one continuous edge. You can make a model of a Möbius strip by joining the two ends of a strip of paper after giving one end a 180-degree twist. De Rivera's sculpture is a three-dimensional analog of the usual twisted, rectangular strip. The loop's cross section is an equilateral triangle, and this triangle rotates through 120 degrees before the ends meet to form a complete loop. 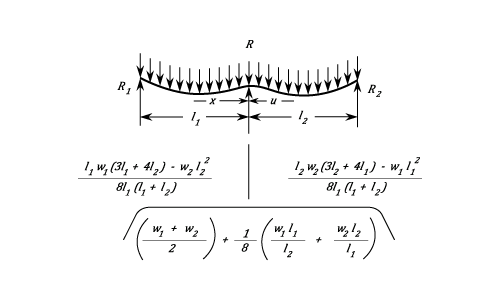 Instead of three surfaces, the final result has just one continuous surface that runs three times around the loop. I find it ironic that this sculptural expression of the Christian concept of Trinity is displayed atop a black granite pillar in front of the National Museum of American History in Washington, D.C. I guess you can get away with religious art if you give it an abstract name like "Infinity". I had a short conversation with one of the sellers at the Lansing-Mason Gun Show. He was guy who retired out of the banking/finance industry due to stress induced health issues. Now he goes to gun shows, buys and sells guns. Life is much, much better for him. You know you went to heaven if you look down and see the young people in your life asking your wife to sell them one of your guns for more than market value so they can have a physical connection with your life, something they can hold onto and remember you by. You look down and see your wife selling your guns to the jerkiest person in your family; for what you told her you paid for them. I took Kubota and one of his friends to the February Lansing-Mason Gun Show. I took Kubota because Mrs ERJ was at a Christian Women's Weekend of Reflection and Kubota was moping after breaking up with his girlfriend of three days. Kubota's friend had never been to a Gun Show. Afterward, Kubota confided in me that his friend wore him out. His friend never stopped chattering. Reloading supplies are coming back. One supplier brought 90,000 assorted primers and they were 2/3s gone halfway through the show. Prices were entirely reasonable. 1000 CCI small pistol were $32.50. I can find cheaper prices on the internet until you factor in the Haz-Mat fees. One pound cans of powder were available at $26-to-$30 per pound. I even saw an eight pound jug of TAC which had to be as rare as a cricket at a hen convention. The supplier was asking $170 for the eight pound jug. Yup, they had it. FMJ commodity bullets were $25/hundred. Name brand, loaded jacketed hollowpoints were about a dollar a round. The least expensive 7.62X39mm was $6 for twenty. Bricks of .22LR were available for $50. Most people who support the shooting sports are ardent conservationists. The Chief Okemos Sportsman's Club had a Sarah Palin look-alike offering passing gents free kisses. Perhaps I exaggerate to say she was a Sarah Palin look-alike. The young lady in the booth was a tanner, leaner and whippier version of Sarah. She had Sarah's smile, Sarah's cheekbones, Sarah's eyeglasses and Sarah Palin's sweater. I hate to see girls reduced to begging strangers to accept tokens of their affection. It is bad for their self esteem. I took her up on her offer, even though I am a happily married man. It seemed like the Christian thing to do. 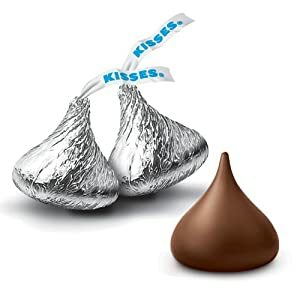 It is OK, I already told Mrs ERJ that I accepted a kiss from another woman. I bought Belladonna some earrings. We have different tastes in jewelry. Belladonna likes large, faceted, sparkly "studs" that remind me of doorknobs. It is my studied opinion is that earrings should look like fishing lures. After all, a successful fishing lure must first attract the affection of a fisherman. To my way of thinking, the perfect earring would either look like a Mepp's #2, silver spinner with a goodly tuft of fluorescent marabou or bright bucktail for a streamer -or- a jigging Rapala in a metallic perch finish. Furthermore, I can point to Matt 4:19 as Biblical support for this approach. For reasons that I cannot comprehend, Belladonna stubbornly retains her impoverished taste in earrings. I keep trying to buy her jewelry and then I must stoically endure her rejections. At least I have the solace of a well stocked tackle box. I made another attempt at today's Gun Show. These earrings appear suitable for Rock Bass, Smallmouth Bass and all species of trout and char. They would catch White Perch, Crappie and, with a teaser of nightcrawler, will be awesome for Walleyes. And those are just the freshwater species....of fisherman. Once again, Belladonna refused my fashion advice. Crushed and dismayed, I will tuck these above the sunshade of the minivan. You never know when you will run across a decent fishing stream with a few extra minutes to kill. I do not have access to a good database, but my perception is that "The Home Team" almost always has a better three point shooting percentage than the visiting team. I think it has much to do with knowing the sweet spots. Listen to a player dribble a ball around the gym . The resonance of the ball striking the floor changes depending on where the ball strikes the floor. That suggests that the springiness of the floor is not uniform. Bruce Kelly defined a "robust process" as a process that can absorb anticipatable variation in the input and still produce an acceptable outcome. Three point shooting is by its nature very sensitive to variation in the springiness of the floor. One way to make a process more robust is to eliminate spurious variation. Robust locations are the places where the deflection flattens out. Mathematically called "local minima/maxima". Locations where there is slope indicate that small variations in position will effect the apparent springiness of the floor. That is, the springiness of the floor will not be predictable and the shooter's launch will not be repeatable. Image from HERE. The shooter really only has two choices. They can launch from the area midway between the rubber support pads where small amounts in variation in position has minimal effect on the floor's resilience. Or they can launch from directly atop the rubber support pad. The area between the pads has the advantage of a larger area. Slight variation in location will not have a significant impact on the apparent floor springiness. The area between the pads has two major disadvantages: The trampoline effect means that the shooter will be effected by the running and jumping of other players in the area. It may be that a defender leaping to deflect a shot has more than a psychological effect...their leap changes the dynamics of the floor. The other disadvantage is that the floor is "spongier" or "deader" in those areas even without the dynamics of the defenders. The area immediately atop the pads is much smaller than the other local minima/maxima but it suffers neither of the disadvantages of the areas "between pads" area so it is the clear winner. But might one find these magical launch pads? The home team shooters have an advantage because they found "the sweet spots" by trial-and-error. This is not time efficient and does not work well for visiting teams. It might be possible to find the sweet spots by the sound of the dribbled ball. This is rarely a priority during the pregame warm-up. 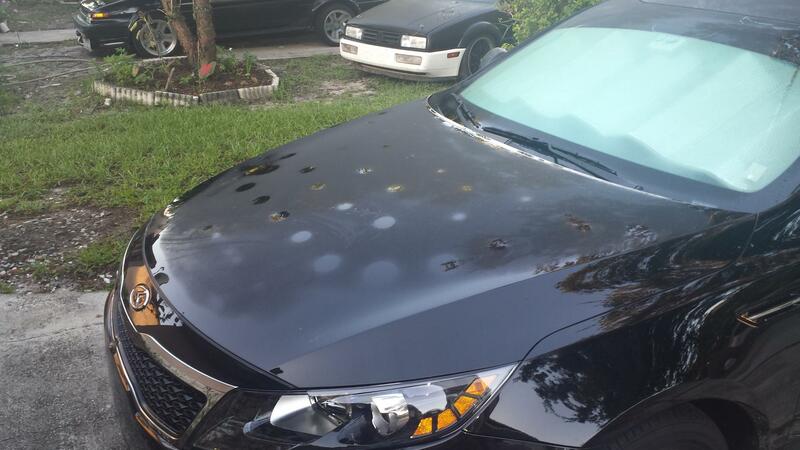 See the spots where there is no dew on the hood of the car? That is due to the heat-sinking effect of the mastic "gumballs" that join the exterior of the hood to the structure beneath it. If will be temperature differences on the floor if the building has day/night temperature differences. It may be possible to map those differences with an IR video camera. Recovering vibration info from "pixel buzz"
Interesting article HERE. It is possible to use brute computer power to extract audio signal from video. It relies on the fact that pixels are very small and that there are many, many of them in every frame of video. That is a lot of data. 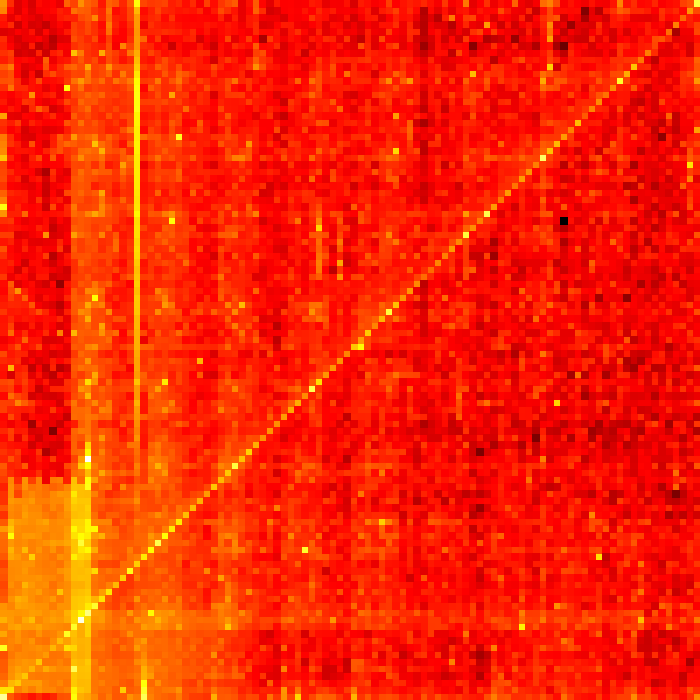 Buzz between adjacent pixels suggests that the object might be vibrating. "Random noise", the bane of sensing, can be diluted if many sets of adjacent pixels are buzzing in synch. There are some factors that make this a viable alternative. One of the factors is the "striped" look of most gym floors. This pattern is extremely friendly for generating pixel buzz for reasons that are easy to explain. You have probably seen a pattern similar to the one shown above. You saw it on the colored "Sunday" comics page. High speed printers use that kind of pattern to synchronize the colored and black inks. When everything is adjusted right, the colored line will intersect the black line in the center of the black line as show. Very slight errors in adjustment maps into large shifts in where the colored line intersects the black line. The printer does not need to make any measurements. He/she can simply adjust the offset ---on the fly, as the press runs---until the lines intersect correctly. That same slightly angled line effect also occurs with the natural variation in the color of the individual pieces of wood. Lots of buzz. I wonder if any of the more "technical" schools are already looking at this. Once found, there is still the problem of communicating those locations to the players. The simplest way to do it would be to "light up" the sweet spots with a laser or some other focused light. I was resizing and depriming some brass yesterday. I have gotten pretty good at it. Different cartridges present different challenges. Small, straight sided, rimless rounds do not offer enough tactile cues to allow sight-free orientation. I was able to use some of the training I received in my pre-retirement profession to improve the throughput of my reloading station. Once I got going I was averaging 15 resized shells a minute with some bursts of 20 shells per minute. That is probably a bit better than average for a single stage press. I took a few pictures to serve as thought starters for any newbies who want to speed up their production. Having stations close together means small movements. Small, smooth movements means shorter cycle times without having to rush. The triangle formed by 1-2-3 is six inches on a side. Grip un-sized brass out of the bin. Grip between tips of thumb and forefinger. Grip near mouth of brass. This is the slowest part of the entire process. Having a single layer of brass in the bin, all with their mouths up would speed this step. The difference between 20/minute and 12/minute is in how much you must bobble the brass to pick it up properly. Obviously, putting a single layer in each bin would require more bins. I purchased my bins from Uline and have been happy with them. The bins I use are 3 inches tall by 4 inches wide by 7 inches long. Clamp the re-sized brass that is on the top of the ram between your forefinger and middle finger. 2.3. Much of the magic for speed is in step 2.3 Crooking the middle finger rolls the resized piece off of the ram. This step could be sped up by repositioning it closer to the press and placing a funnel over the chute to make it an easier, faster drop. Then back to start-of-cycle. There is an error in this picture. The resized shell would still be between the forefinger and the middle finger when it is dropped into the chute. I just ran out of hands trying to run the press and take the pictures. I apologize for the error. One of the challenges of bringing a disabled person back into normal jobs is the need to "work harden" them. Plowing was traditionally done by younger men. Breaking 10 acres of new ground in the spring meant wrestling a breaking plow behind a team of horses after a sedentary winter. Plowing 10 acres meant the plowman had to walk approximately 40 MILES. Photo from HERE. Our maximum ability diminishes with age. Our ability to gain condition slows. Our ability to heal from stresses also slows. In aggregate, men have more physical strength than women. The difference in strength is particularly pronounced in the upper body. Some people have larger frames than others. A woman who is 5th percentile (short) for stature must be in a higher state of condition than a woman who is 90th percentile for stature to lift the same amount of weight. A person who is in moderate condition will gain additional capability more quickly than a person who is already at very high levels of condition. For example: A person who can bench-press 80 pounds can be conditioned to bench-press 160 pounds (twice the baseline amount) in a reasonable amount of time. A person who can bench-press 400 pounds will likely never be able to bench-press 800 pounds regardless of how long and how hard they train. People of moderate condition are also likely to gain capability more quickly than an absolute couch potato who does not have enough stamina to perform a full workout. From Cooper's Age/Gender Normed physical fitness standards. Repetitions of situps chosen as the data charted. Note: Situps are body-weight exercises and are not to be confused with "absolute" strength metrics like max bench press. 80th Percentile 25 year old woman arbitrarily assigned value of 100% and other capabilities normalized to that level. Consider a factory job that is designed to be just within the capabilities of the 50th percentile 25 year old woman. The thought process might be that the half that are not capable of walking up to the job and performing will gain stamina during the training process. Even the 20th percentile young woman is capable of performing 67% of the required number of repetitions the day they start work. They quickly gain capability (i.e. work harden) as they follow their training program. This method worked pretty well when factories only hired young people and there was little job mobility. It also worked well when society accepted age discrimination and looked the other way when older workers were fired. It also worked pretty well when seniority systems allowed older workers (presumably with more seniority) to percolate into less physically demanding jobs. Today factories are compelled to hire a mix of demographics to avoid the stigma of discrimination. Society no longer tolerates age discrimination...many older people are working because they must work. And the nature of work in the factory changed; there are no "easy" jobs, most work is done by teams that rotate through a variety of jobs to balance out the ergonomic stresses on the body. Competitive pressures do not allow factories to lard their ranks with large numbers of "light" jobs. The prospect of success for new, or returning, employees over age thirty appears increasingly dismal. But is it? 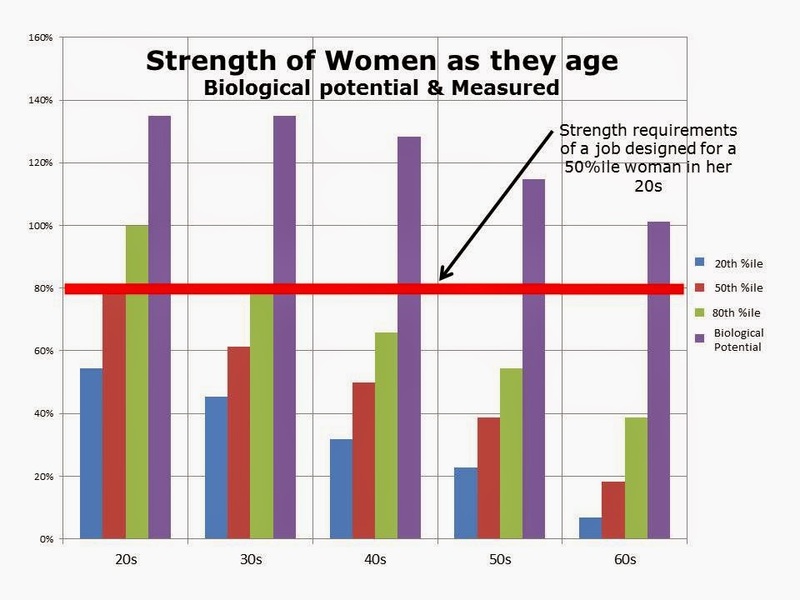 Same chart as above but the biological potential are shown as the purple bar. Cooper's 25 year old, 95th percentile woman and the degradation rate described in the next paragraph of text used to define biological potential. What changed were our societal norms regarding conditioning. We gain body fat as we age. We become much more sedentary. We think we look undignified and pretentious when we stretch. We become absorbed in supporting our kids...we sit on the sidelines and watch them exercise. We let ourselves go. The other thing that changed is the speed with which our bodies heal. Younger people can be very sloppy in their training and still gain strength and stamina without hurting themselves. Conditioning is a process of repeatedly stressing (actually hurting) our bodies and then allowing a recovery period for our bodies to adapt to that stress. Us older folks require longer recovery periods and less aggressive ramping-up of stresses. Older employees can "get there" but our starting line is much farther back from the finish line than for younger employees and we simply cannot ramp up capability as quickly as younger employees. The "work hardening" program that is optimum for the traditional, younger worker pushes too hard and ramps up too fast for the older worker. It puts them at risk of injures. A nearly ideal ramp-up for a new or returning older worker would be to work part-time for an extended period. One example would be to work Monday-and-Friday for several weeks. That would allow them a three day recovery period and a two day recovery period every week. A Monday-and-Friday work schedule has logistical advantages as these days are typically the most highly sought after vacation days. The next logical step in the progression would be to work Monday-Wednesday-Friday. It is my impression that very few Unions will negotiate this kind of stepped return-to-work. Their contention is that any employee cleared by Medical should receive 40 hours of pay a week and finding suitable work is Management's problem. Even in the absences of activist contractual language, many Human Relations departments do not seem to want the additional complexity of non-traditional work schedules. There is a solution. It is called personal responsibility. Even in her mid-sixties a woman who is 80th percentile only need double her capability to meet the job requirements. By contrast, the 20th percentile woman in her mid-sixties must improve her capability by a factor of TEN to match the 50th percentile 25 year old. The process of increasing physical capability by a factor of ten is long, difficult and fraught with the possibility of injury. There is no company named Condottiero & Associates. The small business owner I interviewed requested privacy due to the sensitive nature of his work. Mr Condottiero started Condottiero & Associates when he was fifty-one years old. He had risen to the ranks in middle management in a firm that assisted insurance companies in "placing" people on Workman's Compensation into jobs. He was, after 8 years, ready for a change of scenery. He became an independent "Vocational Case Manager" (VCM). That was in 1997. At that time there was much VCM work in Michigan but the competition was fierce because there were more than 125 Vocational Rehabilitation companies in Michigan. He borrowed money from a family member. The first six months were tough due to the lag time in the reimbursement process. Six months after that he was matching his monthly "net" as a wage earner. He never looked back. At that time, Vocational Case Managers were independent investigators who were paid by the insurance companies because the laws in the State of Michigan made the employer (or, by proxy, their insurance company) responsible for the rehabilitation of that worker. The Worker's Compensation laws are very specific to the state where the triggering incident occurred. Consequently, Mr Condottiero only worked on cases that originated in Michigan. 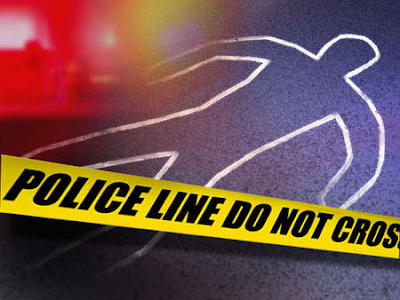 A carpenter in northern Michigan in his early thirties fell off the roof off of a two story building. He was badly injured. His bones healed. He went to physical rehab. His physical capabilities came back slowly, particularly his flexibility. He continued to experience back pain that prevented him from returning to his previous employment. Mr Condottiero scheduled an appointment for an initial interview. That interview took place in the client's home, 115 miles from Eaton Rapids. His client was a traditional guy. He was ashamed that his kids came home from school and he was still on the couch just like when they left in the morning. In fact, the client's eyes teared up. He wanted to work. He wanted his kids to grow up with a work ethic. The carpenter was depressed. He was simply incapable of looking for a job. He was not physically capable of being a carpenter. He could not see himself doing anything else. Mr Condottiero contacted several businesses in the area inquiring about jobs that might be within his client's capabilities. He did not tell them that he was attempting to place a Workman's Comp case. One of the large, non-profit organizations agreed to find a place for him in their resale outlet store. Mr Condottiero's client initially resented the job because he considered it demeaning. He started as a greeter, however, quickly became bored and started doing more of the sorting, material handling and working with customers. The store management noticed his change of attitude and were impressed by his enthusiasm. He was offered full time employment. The carpenter ended up as the roving maintenance guy for the non-profit. He was responsible for several large stores in the area. It was a major win for the carpenter since most of the work was "inside work", which is a major bonus in northern Michigan during the winter time. Not all of Mr Condottiero's stories have such happy endings. But enough of the stories do have happily-ever-after endings to make his work very satisfying. The insurance company typically mailed Mr Condottiero a file with the disabled worker's history and "restrictions". One gratifying aspect of making accommodations to put a Workman's Comp case back to work is that the accommodations generally made the job easier for everybody and reduced the likelihood of further repetitive motion injuries. The most desirable solution was to have the disabled worker return to work with his/her original employer. Many of these shops were small and did not have much expertise in making "accommodations". Most Vocational Case Managers will assist in re-engineering work spaces to accommodate people with restrictions. Mr Condottiero enjoyed more freedom working with employers as an independent agent than he did as an employee. He is more than willing to offer his expertise in modifying the job if the employer is willing to accept that kind of help. Examples of accommodations might include work benches that are tilted-and-railed so parts naturally slide to be closer to the worker thus minimizing reach. 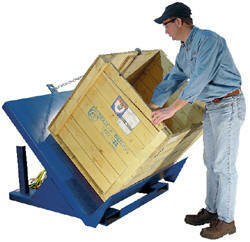 Accommodations might include variable height or tilting stands for stock baskets to minimize bending over and lifting. Accommodations might include straps or loops tied to overhead tools to minimize above shoulder reaching. Sometimes the accommodation is as simple as a carpenter's apron to carry fasteners to reduce gripping multiple fasteners (Carpal Tunnel stressor). If it was not possible to modify existing work to be within the employee's restrictions and there were no jobs within the facility that met the employee's restrictions, the Vocational Case Manager developed lists of jobs within 30 miles that were within the employee's capability. The VCM also arranged interviews at those jobs for the client. In addition to Mr Condottiero's other qualifications, he has a Master's Degree in Clinical Psychology and a license to practice. He had some interesting observations regarding the psychology of the various stakeholders. The claimants cover the enter range of human integrity. Some are scammers and are simply out to defraud the system. Most claimants are not scammers. They want to go back to work but they are scared. They fear re-injury. They know they have lost "work hardening", the physical conditioning that results from the physical demands of doing the job five days a week. They may also be apprehensive about how their bosses and coworkers will receive them. An additional concern of the claimants is that they will be "...stuck flipping burgers for minimum wage." Mr Condottiero assures them that getting a good job is like getting a good girlfriend. It is much easier to get a girlfriend if you are already dating another girl. There is the presumption of "there must be something wrong with him" if you are not already seeing someone. Mr Condottiero assures his clients that good things will happen after they accept the "burger flipping job" and create evidence that they want to work. During the process of writing this essay, I contacted two business bloggers whose work I deeply admire: Coyote Blog and Of Two Minds. I asked if there were any questions they would like me to address. Both bloggers requested that I ask about disability fraud. Unfortunately, there are people who are successful at defrauding the system. Figures are not available for Workman's Compensation but there are statistics available for Social Security Disability. The number of people with active cases has gone up, but so has the percentage of applications that are rejected. As a frame of reference, there are approximately 110,000,000 households in the United States. So approximately one in every twelve households has a person receiving Social Security Disability payments. (This line is too smooth! It gives the appearance of quotas or targets.---ERJ observation) Data from Social Security Administration. The rejection rate for applications steadily rose from 50% in 2000 to more than 67% in 2014. That is, two out of every three applications for Social Security Disability is rejected. Data from Social Security Administration. 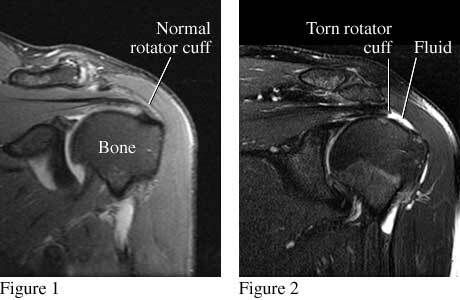 Increasingly sophisticated medical imaging and standardized evaluation protocols help winnow out many of the fraudulent claims. Example of a standardized evaluation protocol. Picture from HERE. You can report Social Security Disability fraud through this website: https://www.socialsecurity.gov/fraudreport/oig/public_fraud_reporting/form.htm. Confidentiality is one of the options available. The appropriate venue for reporting Workman's Comp fraud can be quickly found by performing a search with the following keywords "(your state), workers compensation fraud inspector general". Hint: It is easy to copy-and-paste the words from this essay into the key-word window of your favorite search engine. It is possible to start a professional services business even if your service is "thinly traded"
The upside of "thinly traded" is that you are competing against a shallow talent pool. Charge enough for your services. Bill for all work done...every phone call, every mile traveled. Either hire or start-up support people in their own businesses. Mr Condottiero hires out accounting, job development and typing. Mr Condottiero mentored five other people in starting their own businesses as he "spilled" work. He kept the parts that he enjoyed doing and hires out the parts other people can do better. Be flexible. The Workman's Comp work dried up after some changes in Michigan laws. He was able to migrate to Social Security Disability consulting because of the thin talent pool for that kind of work. Get professional insurance for protection from law suites. Most compensation is tied to case load. Get smart about delegating work. That allows you to handle a higher case load. For example, Workman's Comp cases used to net in the neighborhood of $1500-to-$3000 per case. A Vocational Case Manager could plod along, doing everything they way they always had done things and handle a typical case load of 20-25 cases per year. Or the VCM could get smart about delegating and handle 60 or more cases per year. Reloading 9mm Parabellum. SAAMI mistake?? ?